SBI customers can now easily request new Cheque Book through SMS. You need to send just an SMS to apply Cheque Book. Now you don’t need to visit the bank to order Cheque Book. This facility available for all customers. You need to send an SMS from your registered mobile number. (SMS charges apply). SBI customers can also request new Cheque Book online through net banking, mobile banking. 1: First of all register your account for this facility, send below SMS from your SBI registered mobile number. You will receive a registration success message. Now you can request Cheque Book by sending an SMS. 2# To apply Cheque Book send an SMS from your register mobile number. That’s it. You have successfully applied for new Cheque Book. Your ChequeBook will be delivered to your registered address within 10 days. You can also visit net banking chequebook history to know about your new issued chequebook details. 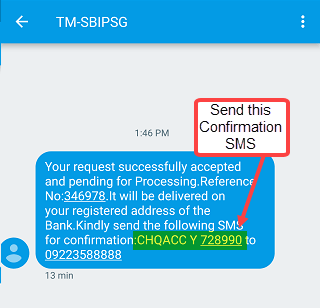 So this is how you can request/apply SBI Cheque Book Through SMS (by sending an SMS).